Although some of us may have indulged in too many treats over Halloween, more of us have a greater struggle towards the end of this month as the official holiday season kicks off with Thanksgiving. With all of the celebrations, parties, travel, extra dinners/drinks out and food everywhere, this time of year can become quite challenging to the waistline. 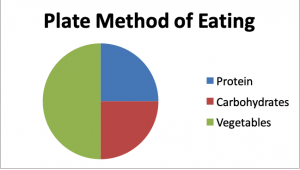 More food means extra calories, and calories DO count. Since 3500 calories equal one pound of fat, it’s easy to see how pounds can creep on slowly. Below are some of my best tips to stay on track, starting with your turkey! 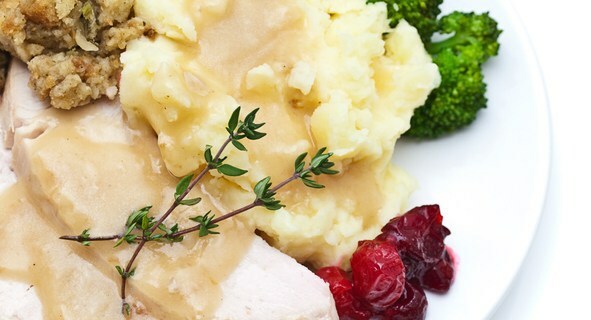 – Instead of dark turkey meat, choose the white meat (or at least try half dark, half white). It is a lean protein that is lower in fat, cholesterol, and calories. Skip the skin. This is the part of the turkey that is highest in fat, cholesterol, and calories. 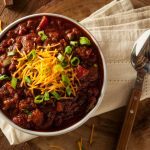 – Yes, we all know turkey can taste dry and boring (especially the white meat), which is why we love our cranberry sauce and gravy toppings. 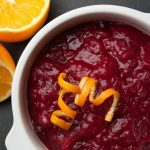 Cranberry sauce has a great, sweet flavor and is lower in sodium, fat, and cholesterol than regular gravy. Yes, cranberry sauce is often high in sugar and can add up quick in calories, so keep your portions small. 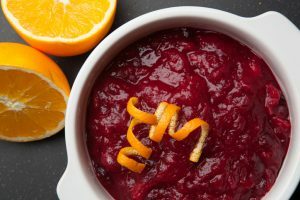 If you are hosting OR have the opportunity to bring a dish for your holiday meal, try my recipes: Cranberry Pear Sauce (no refined white sugar/sweetened with pears) and Mushroom Gravy (none of the cholesterol since it’s meat and dairy free). 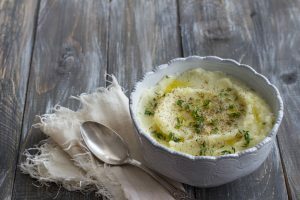 – Instead of cream and butter, mash your potatoes with skim milk and ghee, cholesterol-free margarine or spread, OR olive oil. Season with garlic, chives, salt, and pepper to add flavor. Or try using Greek or Icelandic yogurt (like Siggi’s) for a creamy taste. You could also try Cauliflower Mash instead of mashed potatoes. If you are already serving carbohydrates such as sweet potatoes and stuffing, it’s great to add an extra vegetable option. – Fill up on vegetable appetizers. They are high in fiber and make you feel fuller longer. This will help prevent overeating during the main meal. 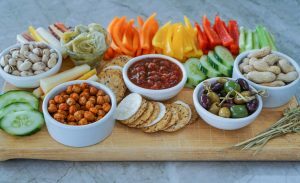 If you are hosting, make sure to put out a crudités (peppers, celery, broccoli, cauliflower, carrots, cucumber, jicama) with dips such as guacamole, salsa, hummus, tzatziki. I love Cava brand for dips as they are lower in calories! – If you are a guest at someone else’s house (and you are unsure what they may serve you), spoil your appetite. Have a significant filling snack or small meal before you go: yogurt + fruit, a salad, vegetable soup, or even half a sandwich. This way you will not arrive hungry at your dinner and will be less tempted by unhealthy options. 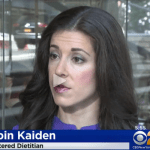 DO NOT “save your calories” for your large, late holiday meal. If you eat a large quantity (think: holiday meal, drinks, dessert) of calories late in the day, there is likely not enough time to burn them off before you go to bed. – If you are hosting Thanksgiving, you have the control (and your guests will thank you) to offer healthier, higher fiber options (fiber helps you feel full). Serve a green salad and/or vegetable soup for beginning courses. Make a vegetable, nut, and/or whole grain-based stuffing. 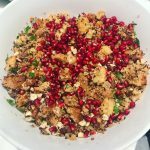 (See my Butternut Squash and Pomegranate Quinoa Stuffing recipe.) Include another vegetable side, such as Brussels sprouts, asparagus, green beans or zucchini. – Offer and/or choose healthy hors-d’oeuvres. Try the crudités mentioned above. Add whole grain crackers (GG Fiber, Brown Rice Crackers, Flackers, Mary’s Gone Crackers, Jilz Crackers) and whole grain bread with lower fat cheeses: parmesan, feta, goat, mozzarella. Try adding shrimp cocktail, plain nuts, olives, and fruit as healthy options and/or part of your cheese plate. Be on Portion Patrol, especially if you are eating family or buffet style. Put everything on your plate first so you are aware of what you are eating. 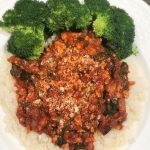 -Plate Perfect for better balance: Make sure 1/2 of your plate is filled with a vegetable, 1/4 with a lean protein, and 1/4 with a starch, preferably one that is high in fiber/whole grains. Fruit for dessert–you will be surprised how popular this will be, you can have a protein powder supplement shake along with it to feel fuller. 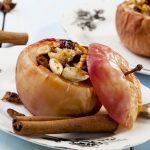 Try the baked apple recipe below and avoid the high-fat, high-calories crust of apple pie. Work out! A lot of gyms ARE open on Thanksgiving Day, so get in a good sweat before you sit down for your meal. OR make sure you work out Wednesday and/or Friday of Thanksgiving week. If you are away and/or not near a gym, go for a walk, run, jog, do a workout video and/or play an exercise/active video game. If you DO indulge on Thanksgiving, remember it is just one day or one weekend. Get back on track immediately to healthy eating and exercise habits!! !